French theorist who developed the mechanical philosophy, which was highly influential until superseded by Newton's methodology. He believed that matter had no real qualities, but was simply the "brute stuff'' which occupied space. He divided reality into the res cognitas (consciousness, mind) and res extensa (matter, extension). His mechanical philosophy led him to believe that the universe is a plenum in which no vacuum can exist. In Traité de l'homme (Treatise on Man) (1664) and Passions de l'âme (Passions of the Soul) (1649), he expounded the view that an animal was an automaton lacking both sensation and self-awareness, and that only man was endowed with a soul. He generalized Harvey's mechanical interpretation of circulation, believing that the heart is an automatic mechanical pump. He also believed that colors were caused by the rotation of "spheres'' of light, using the tennis ball as a model of a spinning sphere. He, unlike Newton believed that white light was the pristine form. Descartes gave the first formulation of what is now known as Snell's Law of refraction. Descartes believed that God created the universe as a perfect clockwork mechanism of vortical motion that functioned deterministically thereafter without intervention. Descartes said that the fundamental force of motion was Mass times Velocity (today known as Momentum), not the quantity which Leibniz called vis viva. Although this formulation was correct, Leibniz nonetheless maintained that the measure of a body's "force'' was not given simply by the product of Mass times Velocity, but instead by the product of Mass times Velocity squared (which is proportional to what is now called Kinetic Energy ). Since the conservation of quantity of motion had become one of the pillars of Cartesian natural philosophy, Leibniz's suggestion that the fundamental quantity of motion was different from the one Descartes had proposed was rejected out of hand by all good Cartesians. A great controversy ensued between the German school of physical thought, which naturally supported Leibniz, and the French and English schools, whose Cartesians and Newtonians opposed him. 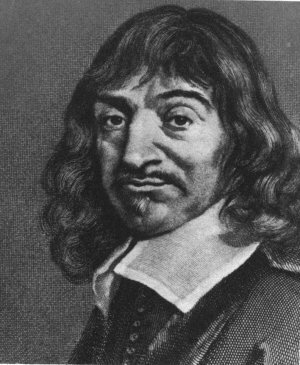 Descartes believed that a system of knowledge should start from first principles and proceed mathematically to a series of deductions, reducing physics to mathematics. In Discours de la Méthode (1637), he advocated the systematic doubting of knowledge, believing as Plato that sense perception and reason deceive us and that man cannot have real knowledge of nature. The only thing that he believed he could be certain of was that he was doubting, leading to his famous phrase "Cogito ergo sum,'' (I think, therefore I am). From this one phrase, he derived the rest of philosophy, including the existence of God. He also was the first to make a Graph , allowing a geometric interpretation of a mathematical Function and giving his name to Cartesian Coordinates.